What does it take to be successful on the Web? The answer to that is simple and yet not so simple: Provide relevant information. Make it easy to discover. How do we make sure that we provide relevant information on the DAS Web Site? We let go of the content. That is, we entrust its care to nearly 30 content managers – researchers, educators, extension professionals, students – our experts around the state and in neighboring states. Along with regularly contributing their knowledge and expertise to das.psu.edu, these individuals continually seek and apply feedback from you, our clientele. And to guarantee that this content is accessible to every one of our users, regardless of individual needs or technologies, we continually test and readjust how the site delivers that information. So, is it working? The message from you, our users, is yes. From January 1 of this year to the present, the Dairy and Animal Science Web Site was visited 146,288 times – an average of about 841 site visits each day. Compare this with benchmarked sites containing similar content, which received an average of 17,056 visits during the same time period. 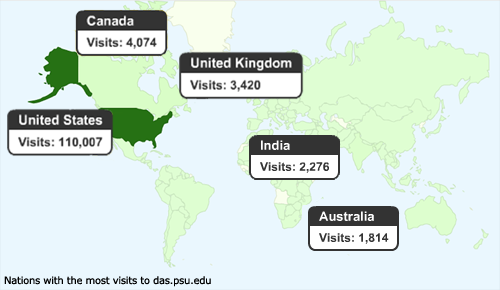 Visits to das.psu.edu averaged a handful of page views each and added up to a total of 488,322 page views. This is compared to an average of 55,172 page views in the same time period on similar sites. Our visitors spent, on average, about 3 minutes reading the Web page(s) that that interested them – approximately the time it takes to give a Web page a fairly thorough perusal. Considering that the tendency of users on the Web is to skim rather than read, this is an impressive amount of time to linger over Web content. But perhaps the most telling is this: A total of 15,520 users repeatedly visited the pages they consider the most valuable to them – an average of more than 200 times each. Aside from the United States, countries with the most visitors are Canada, with 4,074 visits; the UK, with 3,420 visits; India, with 2,276 visits; and Australia, with 1,814 visits. In addition, we receive a significant number of visitors from Spanish-speaking regions of the globe, which has lead us to translate much of our key information into Spanish (the DAS Web site is one of a very few sites at Penn State to offer Spanish content). 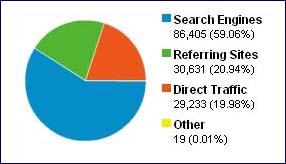 Search engine statistics can be a gold mine of information. By studying the most commonly used words or phrases entered into Web searches, we can better understand what our users are looking for – and if possible bring them to us sooner and make information even easier to find. Year in and year out, the most popular content on the DAS Web site revolves around the main Dairy Science pages, Dairy Nutrition – including information specific to Calves and Heifers, dairy reproduction, Dairy 4-H, Dairy Digest, the Capital Region Dairy Team, and Penn State Dairy Alliance. Visits to all dairy-related pages total 99,788 since January 1. Equine ranks second only to Dairy. Since January 1, equine-related pages have collected 57,226 visits. This includes the main Equine Science pages, the Penn State Horse Newsletter, and the 4-H Horse Program. Pages addressing Goat Health, Nutrition, and Reproduction and the 4-H Goat Program received the third most visits – 28,126 since January 1. The Publications Catalog is one of the most valued resources on the DAS site, getting 19,096 visits so far this year. The catalog contains articles, fact sheets, presentations, videos, podcasts, and other multimedia. Users frequently seek contact information (in addition to other material) when visiting a site. So not surprisingly, our Faculty-Staff Directory averages about 2,000 visits each month. So far this year, it has received 15,563 visits. Along with contact information, visitors are interested in vitae, publications, and individuals’ Web sites, such as the Dairy and Animal Science Blogs. These days, most of our site visitors have high-speed connections and current-generation Web browsers. A significant number, however, still use dialup (nearly 7,000 site visits so far this year) and have older Web browsers. 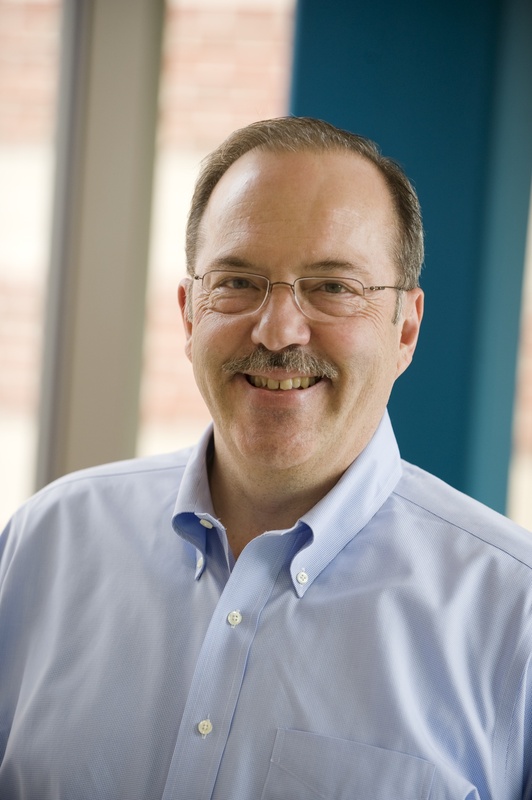 However, this does not pose a problem because the Web Standards-compliancy of das.psu.edu means that its content is accessible regardless of connection speed or browser generation. Thank you for your loyalty! Now, what can we do better? We appreciate how our users have let us know that the DAS Web site is providing informative, usable content. You have made this clear not just through usage statistics, but through your comments and feedback. We want to continue to improve your experience at das.psu.edu. Please let us know what you need.